An astonishing number of people in Ghana still do not know more about wetlands and it’s impact on our socio-economic & ecological development as a Country. Meanwhile, an alarming percentage of wetlands in our Country have been degraded with the remaining wetlands disappearing 3 times faster than forests with the number one reason being the overwhelming lack of awareness creation. It is in this vein that we at Disasters Network, Ghana or DisNet, GH deem it necessary to intensify the sensitization as part of our activities for the World Wetlands Day which falls on 2nd February, 2019. Wetlands as we all know occur where water meets land & it includes mangroves, marshes, rivers, lakes, deltas, floodplains, flooded forests, rice-fields, and even coral reefs. They exist in every Country and in every climatic zone, from the polar regions to our tropics, and from high altitudes to dry regions. In Ghana, they can be found in almost every town or village and they are vital for human survival. They are among the world’s most productive environments; cradles of biological diversity that provide the water and productivity upon which countless species of plants & animals depend for survival. Wetlands are a critical part of our natural environment. They protect our shores from wave action, reduce the impacts of floods, absorb pollutants or remove pollution, improve water quality and recharge groundwater supplies. They provide habitat for variety of animals and plants and many contain a wide diversity of life, supporting plants and animals that are found nowhere else including mammals, birds, fishes, invertebrates and many variety of aquatic flora. Unfortunately, the increasing levels of human activity and infrastructural developments over time, especially have contributed into the gradual depletion of our wetlands mainly due to extremely lack of awareness of the significance of wetlands and also institutional failure from our Physical Planning Department, the Hydrological Department & the Climate Change Department of NADMO. It is in this vein that, we call on all stakeholders to join in efforts to intensify the public education on the importance of wetlands to climate change adaptation, disaster risk reduction etc. The Earths Climate is rapidly changing but we are not powerless against Climate Change. Our Wetlands provide natural solutions in coping with climate change. Lets all assist in halting the draining of wetlands for building projects and other purposes and rather help to conserve or restore our wetlands. 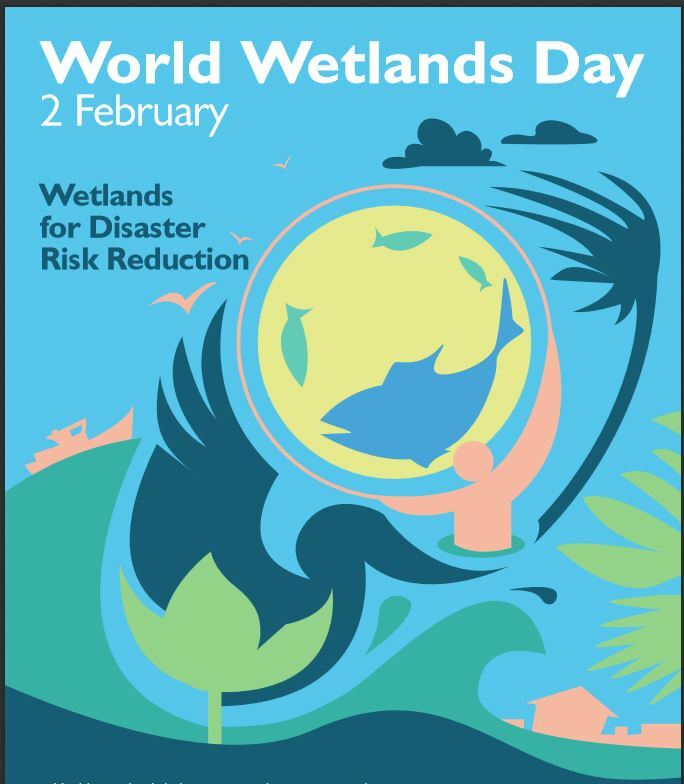 The count down to the 2019 World Wetlands Day is on with only 3 days left until 2nd February. More than 800 events are happening around the World to raise awareness about the value of wetlands for climate change action. The link between Wetlands, Climate Change and Disaster Preparedness is very strong, hence our clarion call on all citizens and stakeholders to join hands with DisNet, GH in raising the awareness. Nobody can exercise control over the occurrences of disasters. A hazard does not discriminate against anyone; it hits the poor just as badly as it strikes the rich. Therefore all citizens must be disaster conscious and work towards disaster preparedness & disaster prevention; in this instance, raising the awareness level of the importance of wetlands for the citizenry to work towards conserving the remaining and also restoring the drained. Wetlands are needed for Climate Action, Water Security, Food Security and Flourishing Biodiversity so Keep them and STOP DRAINING THEM.